We absolutely love our gorgeous new kitchen! LEFKO’s detailed planning, constant communication and fast execution were remarkable. David and his team finished my kitchen ahead of schedule and went above and beyond to make sure my every need was taken care of. Their process made the project simple and manageable and now I'm enjoying my amazing Kitchen. Our experience with the Lefko Renovations was wonderful from start to finish. David and his crew were always on time, pleasant, professional and trustworthy. Throughout the project, the workplace was just as clean each evening when the crew left as it was before the renovation began. The craftsmanship and attention to detail during the entire project was impressive. The communication with David was unlike any other construction project I have been involved with. It was clear throughout the project that the goal was to complete the remodel beyond our expectations. They not only exceeded our expectations but were able to make the entire process enjoyable as well. Our bathroom looks fantastic! Lori and I couldn’t be more pleased with the work David and his team has done. We are thoroughly impressed with the attention to detail, constant communication and extensive pre- planning process. The project started on the day we left for vacation and each night we received a dozen or so digital photos of the day’s work and an outline of progress and next steps. Every phase of the project was done ahead of schedule. When we would suggest a change or have a question David was extremely accommodating and helpful. David said all along that his goal was not just to exceed our expectations but to blow us away and they did just that. I can’t stop bragging about my beautiful new kitchen and bathrooms! I also can’t stop bragging about our wonderful experience with David and everyone at Lefko. From my first meeting I knew that I had found the perfect company to handle our renovation projects. They listened to what we had in mind and then with the help of their talented designer, William – we were presented with our ideas in an easy to understand 3-D presentation format. From there David presented us with an extremely detailed proposal for the entire project. Prior to the start of the project we received a selections checklist with the names of the vendors to select the cabinets, granite, tile, etc. Each one of their vendors was extremely knowledgeable and very professional. Lefko made sure that all materials were received and ready to be installed before the project started so there were no down times during our projects. Both of our projects were completed ahead of schedule and on budget! I really appreciated the few “extras” that they did that weren’t in our contract. Their workmanship is of the highest quality. Communication was amazing – I received a call from David each morning to let me know what was planned for that day and at the end of the day David would call to review what was accomplished that day and to see if I had any questions. David was always accessible by cell and/or Black Berry – which gave me a lot of comfort. All of his workers are very professional, polite and cleaned up the work area each day before they leave. Having our house professionally cleaned at the end of each project was a very pleasant surprise. David and Lefko are the BEST! During the past 10 days, your company entirely renovated two bathrooms, restored a large deck and performed numerous other tasks throughout my home. It was an absolutely remarkable experience in every phase of this project.You were enthusiastically referred to me by friends who were thrilled with your leadership, personal integrity, professional approach and quality of work performed for them. My expectations were surpassed at my home as I enjoyed the same experience.I appreciated your attention to every detail and repeated desired for me to be happy! Your workers were excellent. Your people and resources for stone, tile and hardware were wonderful. Your focus on cost efficiency, protecting the remainder of my house, providing frequent updates, completing the projects so quickly and performing the “unexpected” all exemplified your superior personal and business ethics, project management, relationships with vendors, co-workers and customers, and recognition of an exceptional job. Many, many thanks! Our experience with Lefko was exceptional… From the beginning of the process to the finished kitchen we were ``blown away``. We first met with David and discussed our budget and some ideas. We met with his designer and discussed what I wanted my new kitchen to look like. We were able to decide on a design and stay within our budget. The thoroughness of their proposal was wonderful. Everything was clearly explained in writing and a time line was defined. The speed and quality of execution was exceptional. The people that worked in our house were courteous, clean and considerate. All of their vendors were very easy to work with and had great ideas. David's customer service is excellent. He is easy to reach and keeps in touch. Our kitchen was completed well ahead of schedule. We cannot stop talking about the positive experience we had with David and the Lefko group. This summer we contracted LEFKO Renovations to remodel our bathroom. We chose LEFKO due to an excellent reference from friends that recently remodeled their Kitchen with them and were extremely happy. Right from the beginning they were very communicative and make the decorative selection process very easy. Our bathroom turned out perfect and then we decided to extend our deck. The project turned out better than expected and added to the project all the exterior work including painting, fencing and re-screening our porch. The crew worked diligently in the hot summer days and completed everything in our wish list to our complete satisfaction. At the end of each day, the crew took time to thoroughly clean up all work areas. Both David and his crew were extremely pleasant to work with. We highly recommend LEFKO for all remodeling needs. From the first conversation I felt that I had found a company that loved what they did, and it showed. I have tried to come up with one word to describe our experience with Lefko and, while narrowing it down to one word was hard, I have determined that word is professional. From that fateful first phone call to the final walkthrough, Lefko has shown the utmost in professionalism. Marc, I remember hearing you say in our first meeting that you weren’t looking for happy clients but rather you were looking for ecstatic clients. Ecstatic clients don’t just happen. They are created by your hard work and dedication. They are created by standing behind what you say. They are created by your creation of realistic expectations and follow through on your end of the bargain. I can truly say that now when I hear people tell their horror stories of their home renovations, I can interject with my wonderful experience. It is no wonder that your clients walk away so pleased because the professional, kind, supportive experience leaves us with no other option. Thank you for making this a wonderful experience. And, for the record, we ARE ECSTATIC! Lefko Renovations exceeded our expectations in all regards from beginning to end. The Lefko process is one that considers all aspects of renovation, and thoroughly covers all concerns that any home owner would have. It comprehensively walks through all process stages, and David remained the direct contact each step of the way. He and his team are professional, considerate, timely, fast-paced and concerned about detailed perfection. Project delivery was less than half the time that was promised, with no ``shortcuts`` and there were no problems with changes made along the way. It was obvious that David's primary concern was customer satisfaction and high quality product delivery. Though the expectation is for good service, David gave us daily status updates in the morning of the work that would be performed that day, and again in the evening to confirm the work that had been done. He checked in with any questions to be certain that we were always in agreement prior to any part of the process continuing. He was at our home frequently, and was always available to answer any questions and respond to any issues. Kudos to the final touch upon project completion of having a top-to-bottom cleaning provided for the entire house! These guys are the real deal…no bait and switch here! Lefko Renovations remodeled two of our bathrooms at the same time – in less time than I had anticipated. It is a pleasure to work with a company whose work is superior in quality and integrity. Every detail was addressed and done well. Communication was superb – there was never a day that we did not know what would be happening. In addition, much care was taken to protect our home and our privacy. We couldn’t be more pleased with our bathrooms…I smile every time of use one of them! I give my highest possible recommendation to LEFKO Renovations to anyone considering having quality renovations to their home. Marc was my main contact; his concern for my complete satisfaction was extraordinary. No detail was too small until everything was done exactly the way I wanted it. The staff who worked in my home did a beautiful job. They also made an effort to be as unobtrusive as possible. They thoroughly covered the work areas and cleaned up well each day before they left. Having a renovation done in your home is never easy, but I don’t believe anybody can do it better than LEFKO Renovations. The LEFKO team was top notch professional all the time. Their organization and efficiency in managing our whole house renovation project took what could have been a dreadful experience and made it wonderful. David was constantly on top of all his employees as well as all the vendors we worked with. The workmanship on my house is unbelievable and we are still finding little nice details that they added to the project. Our house was finished weeks ahead of time, and completely on budget! LEFKO delivered our two bathroom renovations on time and with exactly what was promised! Their employees were terrific and each of their vendors was professional and knowledgeable and also remarked how organized the LEFKO business was. It was so refreshing to work with a company that always made you feel and proved that no challenge was too big and everything would be worked out to our liking! A significant part of my house had to be gutted after the discovery of mold. I hired LEFKO Renovations. They were efficient, responsive, professional and did excellent work. I have received only compliments about their work. I would definitely recommend them. And we are not related!! Thank you LEFKO Renovations for a job well done. The interior remodel you did at my house is fantastic. The job was done quicker than anticipated and the quality of the work exceeded what I had expected. You came in under budget even when you did a few extras not in the contract. Having worked with contractors and builders my whole life I can say without any reservation you are the best I have encountered.I will use your services again and recommend you to anyone I know seeking your service.There were no (zero) disappointments during the entire 5 weeks ofconstruction. Thank you so much for the complete transformation of our master bathroom and the entire new feel of our home. David and his “family” crew worked tirelessly to complete a major project quickly, neatly and completely beyond our expectations. There was never anything that they could or would not do to make us 110% happy with the project. His team works hard, long hours and completely unobtrusively. The project that was to take 6-7 weeks was completed in under 4 weeks and within budget! Their professionalism and attention to detail was superior to any other contractor we have ever worked with. It was a fantastic experience. LEFKO’s professionalism, whatever it takes attitude, and meticulous attention to detail, exceeded my expectations and made it a fun and exciting experience. They completed the project on budget and 4 weeks early…! We have been more than pleased working with LEFKO. They made what could have been a very stressful situation almost a pleasure. Lefko’s crews were on time, efficient and became like family to us. The two bathrooms were completely gutted and renovated in one week with Marc paying numerous daily visits to check on things. We are so happy with the results! What we had put off for years turned into a wonderful experience. The Lefko Group exceeded my expectations in every way. Although this was a small project, the experience and quality of work the Lefko team demonstrated was impressive. I was particularly impressed with the diligence and commitment of the crew. Every night before they left, the worksite was cleaned up and debris removed. After the project was completed, they invested the time to inspect the site to assure that any construction material that may have blown into the yard was removed. Working with Lefko was an absolute pleasure. I found all involved to be cordial, honest, and loyal with a high quality work ethic. The mutual respect amongst all members of the group insures a pleasant work environment. My experience with Lefko has been extremely positive with both personnel and with work quality. LEFKO Renovations was able to complete our master bathroom renovation in just 5 days! The workers were on time, thorough, and very hard working. The last day they even stayed late, hours after they normally leave, to ensure the plumbing was working correctly. Robin and I just wanted to thank you for an excellent job... Your crew always arrived as scheduled, was very professional, and cleaned up the work area well. You did a fantastic job! Please use us as a reference for future clients. We have recommended your company to our friends already. When LEFKO renovated our office, I was not prepared for the high level of attention to detail, professionalism and excellence of work. Tomas was in contact with us both in person and on the phone over every detail, so they could make sure everything was completed to our expectation and the satisfaction of Property Management. In fact, Tomas and his crew exceeded our expectations with the quality of the work. They worked over 3 weekends and each Monday when we came in to work, everything was cleaned up and all furniture was put back in its rightful place. We know that LEFKO’s primary focus is residential renovations, but they bring the same quality and excellence to commercial renovations, also. We give LEFKO the highest recommendation possible. They are a firm with a high level of honesty and integrity and it shows in the excellence of their work. We want to thank you for all the effort you and your crew put into making the renovation of our basement. You were very easy to work with and your ideas for the renovation exceeded our expectations. Your estimates were reasonable and on target. In those rare cases where there was a problem you responded immediately and had a workable solution. The people you had working directly for you and those that you subcontracted were terrific. In addition, we also took advantage of your organization to modernize our garages. Thanks again to you and your team for a job well done. We had a wonderful experience with LEFKO. They exceeded our expectations and truly went above and beyond. We highly recommend them! This is the second time we have used LEFKO Design + Build for our home projects. Their professionalism and commitment to high standards differentiates them from the competition. They listen to your needs and come up with excellent recommendations. My husband and I were first introduced to Lefko a few years back when we were looking to remodel our first home. Through many conversations and guidance they helped us and have worked on several projects throughout the years. These latest rounds of renovations were the largest and most detailed. They took on 5 separate projects and managed them to perfection. Not only did they keep us informed every step of the way, the detail oriented nature of Lefko’s work far supersedes any of the contractors we initially bid the project out to. They came in 2 weeks early ahead of schedule and we couldn’t be happier. We highly recommend them for any redesign or new design for your home. We will continue to use them in the future for any work needed at our house. We found that working with LEFKO Design + Build gave us a sense of security in that they would deliver what we had contracted for in our home renovation. The end product is beautiful. They were always there for us and communicated daily and in a timely fashion. This made us feel very comfortable as we had never renovated a house before! Working with LEFKO was a great experience. I found their quality standards to be very high. If something wasn't quite right they got it corrected, usually before I even mentioned it. There was no cutting corners. The quality of materials and workmanship was wonderful. All of the subs that I met operated with the same high standards. My project manager was on top of the work being done in the house and provided updates. When something unexpected occurred (as will happen with a whole house renovation) we worked together to determine what to do. I'm very happy with the house and would work with LEFKO again. LEFKO helped to make our second floor remodel worth the effort and disruptions it took to get the job done. The attention to details that went into planning, selections, and scheduling their crew, plus subcontractors, kept the project organized. When unforeseen changes were necessary, LEFKO helped in many ways to work with us and made every effort to minimize disruptions, keep us on schedule, and on budget. Every single LEFKO employee that we came in contact with was exceptional in professionalism. We are very pleased with our project. We are extremely pleased with our master bathroom renovation and have received many compliments from our friends and family. Everyone involved with the project did an excellent job. Cleaning the home each night before they left was very much appreciated. We also appreciated the flexibility of everyone to meet with us at our convenience, the quick response to any question, and making sure we stayed within budget. It was a very positive experience and will certainly use LEFKO again for future projects! Great People at LEFKO Design Build. Felt very comfortable leaving our house open all day during the project. Our house was clean and tidy after each days work. The project manager secured the premises at the end of each day. Many companies provide superior quality work as does LEFKO, but, LEFKO's people make the difference. This is the first time my wife and I worked with a professional contractor. David and Mitch communicated with us daily and responded appropriately to our concerns. Their work was exceptional and I trust them to do the right thing. We will use this company again because they are professional, trustworthy and good people-from David to his painters, plumbers, electricians, tile masons and every other member of his team. We were very impressed with LEFKO’s professionalism, communication and attention to detail. They also went above and beyond with some of the upgrades they did for us. All of the men who worked in my home worked very hard, for very long days and were always very pleasant. From the first moment that we contacted LEFKO, they were prompt, efficient and very knowledgeable. They went out of their way to ensure that our renovations were done in the least amount of disruption to us. They were always on time and did exactly what they promised to do. We have had LEFKO for 3 major renovation jobs at our home and on each project they have provided exceptional work at a great price. We are well satisfied with the overall outcome and would not hesitate to recommend and use them again in the future. They were wonderful to work with. We love our renovated master bathroom! LEFKO is very communicative throughout the process and their employees are professional, courteous, and skilled at what they do. Our project manager listened and was very responsive throughout the renovation. LEFKO not only created the most beautiful master bathroom for us, but did it in the most professional manner. The site was kept clean and the workers were prompt and courteous. LEFKO went over and beyond to make sure the process was easy and that we were happy from start to finish. We would absolutely use them again and again. We give them a A+ ! 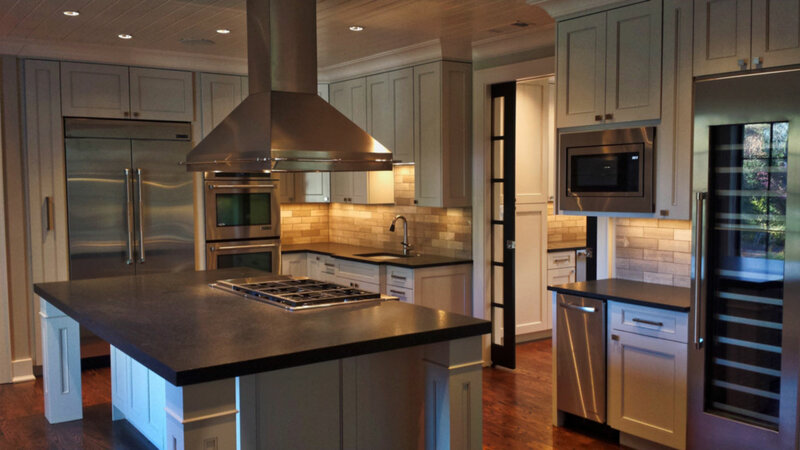 It was a pleasure to work on our kitchen and main level renovation with LEFKO Design Build. They made the whole process so easy. Gave good advice when we were trying to make decisions. Everyone was very professional, did excellent work and finished early and on budget! LEFKO exceeded my expectations. They were courteous, professional and completed the job even past what I thought was capable. They took the extra time to ensure that everything exceeded my expectations. Their professionalism and eye for detail was much appreciated. I would highly recommend them for any renovation work. Lefko’s goal is to make every project excellent, always eager to improve their procedures and processes. In my role as a high performance building consultant and testing contractor, they appreciate the expertise I bring to their projects, providing an extra set of eyes to confirm that the workmanship behind the walls is as good the finishes their clients see at completion. As a technology company I am ecstatic to see the level of sophistication and emerging technology that LEFKO implements within their organization. Which makes their entire process "Fully Streamlined". This is by far one of the most organized builders we have worked with. It's definitely a one of a kind experience! The LEFKO team is a pleasure to work with. They are highly organized and professional in executing each project. We highly recommend them to our clients requiring peace of mind and full service custom home and renovation work. We come into contact and work with companies who specialize in remodels, but we've never met a more satisfied customer base than yours. Every job seems effortless and seamless because of the great knowledgeable staff and the attention to detail and planning. Your customers are educated, prepared and the results speak for themselves - raving fans at the end of the project! I have had the pleasure of working with LEFKO Design + Build for the past few years. I have interacted with everyone in the company and have had a positive experience with each. The homes they build are top quality and their customer service is second to none. From pre-construction meetings to final punch list walk through they are dedicated to customer satisfaction. I am proud to be a LEFKO Partner. They are extremely professional, talented, detail oriented and respectful of their clients’ wishes. I highly recommend LEFKO to anyone in the trade who wants to work with the best people and I would recommend them to clients for their home construction and remodeling needs. What impresses me the most about the company, is their high level of integrity. Our underlying guiding principle is “to always do the right thing”. This makes me feel good about the work I perform and the results are visible. From precise plans, to the best materials, to behind the scenes schedule adherence, NOTHING is “half-done”. As a contractor, I value the LEFKO approach to business and am proud to be the roofing contractor of choice on their projects.